This chandelier is the essence of Art Nouveau with sinewy lines and about the best hand blown glass shades we have encountered in all our years of selling lighting. I guess the optimum word here is exotic in describing the Austrian glass here. The shades look great lit, or unlit. 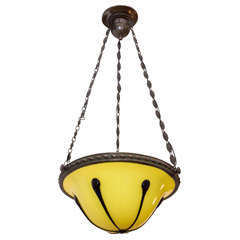 There is some disparity in the color of these shades which is so often the case with hand blown glass. 2 of the shades are a darker color. The body of the light is a warm soft gilt finish. It's a very special piece of lighting. 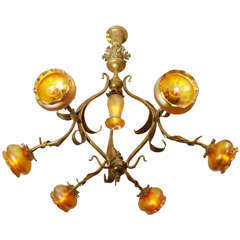 A fabulous English three-light semi oxidized brass Art Nouveau chandelier with beautiful glass shades. The minimum height fully installed is 27" with some additional chain. 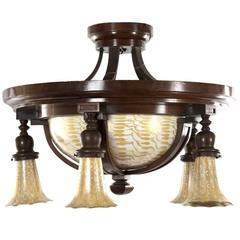 Art Nouveau light fixture with three matching Quezal pulled feather lamp shades. Unique antique Art Nouveau brass chandelier with hand painted milk glass shades, Spain, late 19th century. The piece remains in good antique condition with wear due to age and use. 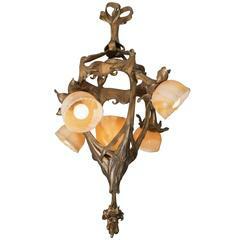 Art Nouveau light fixture with three matching glass lamp shades. Diameter 46 cm. Height fixture 50 cm. Total height 95 cm. Three E27 bulbs.